9 juni 2018: Zo, de Porsche concept car Mission-E wordt vanaf de start van de productie in 2019 de Porsche Taycan en dat moeten we dan uitspreken als tie-con. Dat heeft Porsche gisteren bekend gemaakt. The 2020 Porsche Taycan (pronounced “tie-con”) takes its name from the horse on the Porsche crest, according to the automaker, which itself was taken from the Stuttgart coat of arms. The name Taycan means lively young horse, according to Porsche. When the Taycan arrives, it will feature two electric motors producing more than 600 horsepower and will accelerate up to 60 mph in less than 3.5 seconds. Its battery pack will provide with more than 300 miles of range, measured on the European cycle. The Taycan will likely share its bones with the Audi e-tron GT (but not the Audi e-tron), and will take head on the Jaguar I-Pace, Tesla Model S, and others in a quickly growing luxury electric car movement. In addition to the new name, Porsche doubled down its investment in electrification Friday. Already, the company has committed more than 3 billion Euros to electrifying its fleet, but Porsche added that it would invest a further 3.5 billion Euros beyond the original amount. Porsche has said that when the Taycan goes on sale, it’ll recharge from empty to 80 percent in 20 minutes, which the company has already called Turbo Charging. The Taycan will be built in Stuttgart next year, and Porsche said it has invested hundreds of millions of dollars in new paint shops, motor factories, and transport. Porsche hasn’t said when the new Taycan will show in its final production form, but it’s likely to appear around the 2018 Los Angeles auto show or before. 19 september 2017: Nou, het gaat toch sneller dan men twee jaar geleden had gedacht. De Mission E, de eerste volledig elektrische sportauto van Porsche, komt in 2019 op de markt. Naast een indrukwekkende actieradius van 500 kilometer, is de elektrische sportauto in staat om bij te laden op een vermogen van 350 kilowatt. De Porsche Mission-E heeft slechts een kwartiertje nodig om 80 procent van de batterij op te laden. De Mission E is in staat om in slechts 3,5 seconden te accelereren van 0 naar 100 kilometer per uur. De topsnelheid wordt naar verwachting 250 kilometer per uur. 4 oktober 2015: Mooi hoor. Ook Porsche liet op de autoshow van Frankfurt (IAA) een volledig elektrisch model zien: de Mission E. Helaas is ook dit een studiemodel dat volgens Porsche niet is ontwikkeld om de show te stelen, maar het zou echt de voorbode zijn van de eerste full-electric Porsche. Duurt nog zeker vijf jaar voor die op de markt zal verschijnen. Porsche heeft bij de onthulling Frankfurt bekend gemaakt dat de auto een 800 Volt-aandrijfsysteem heeft, met een vermogen van 440 kW (600 pk). Daarmee kan de auto van 0 naar 100 km/u sprinten in slechts 3,5 seconden en in 12 seconden van 0 naar 200 km/u. Met een ‘turbolader’ kan in 15 minuten de accu voor 80 procent worden opgeladen. De actieradius is maar liefst 500 kilometer. De aandrijflijn van de Mission E is compleet nieuw en tegelijkertijd typisch Porsche. Het model is voorzien van twee ‘permanent magnet synchronous motoren’ (PMSM), vergelijkbaar met die van de Porsche 919 Hybrid die in juni de 24-uursrace van Le Mans won. Samen leveren ze 440 kW (600 pk) aan elektropower, waarmee de Porsche Mission E in minder dan 3,5 seconden van 0-100 km/u accelereert. De elektromotoren wekken energie op bij het afremmen en met een volgeladen batterij is een actieradius van ruim 500 kilometer haalbaar. Bovendien maakt de Mission E gebruik van een uniek 800 Volt laadsysteem, waarmee de batterij in een kwartier voor 80 procent is opgeladen. Laden via een 400 Volt laadsysteem is ook mogelijk. De lithium-ion batterij is tussen de assen in de vloer van de auto onderbracht. Dat zorgt voor een perfecte gewichtsverdeling en een laag zwaartepunt. Beide factoren dragen bij aan het kenmerkende sportwagengevoel van elke Porsche. Ook is de Mission E voorzien van ‘on-demand’ vierwielaandrijving en vierwielbesturing. Porsche is introducing the first all-electrically powered four-seat sports car in the brand’s history: The Porsche E Mission. The concept car combines the unmistakable emotional design of a Porsche with excellent performance and the forward-thinking practicality of the first 800-volt drive system. Key specification data of this fascinating sports car: four doors and four single seats, over 600 hp (440 kW) system power and over 500 km driving range. All-wheel drive and all-wheel steering, zero to 100 km/h acceleration in under 3.5 seconds. Volkswagen’s luxury brand Porsche has been associated with high-performance sports cars, high-end race cars, and more recently, luxury SUVS — all of them powered by a range of internal combustion engines ranging from the legendary Boxer engine to powerful turbocharged V-8s. And electric cars were seen as something of a poorer cousin to those vehicles, their performance deemed too inferior for Porsche to consider building an electric sports car. But for the past year or so, Porsche has been reading its Mission E electric Sports Coupe for market, complete with a 300+ mile range, Tesla-like 0-60 mph time and rapid charging technology that allows the car to refuel from empty to 80 percent full in as little as fifteen minutes. Even then however, Porsche stated it would aim for a relatively low-volume for the Mission E, with the majority of its sales still gasoline. 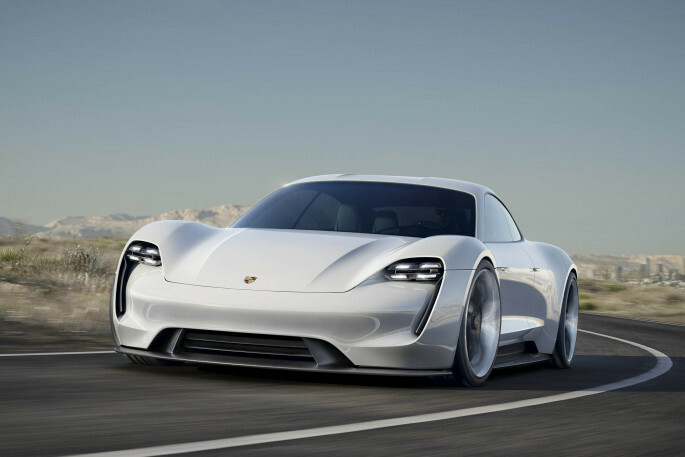 Now that’s changed, with Porsche CEO Oliver Blume stating last week that the company aims to make one half of its vehicles fully electric in just six years’ time. What does that mean for the brand, its attitude toward plug-in cars, and why is it such a big piece of news in the first place? Richard Morgan of Electric Classic Cars. This is an amazing machine, slightly faster than the original 1979 Porsche 911 SC Targa and beautifully converted. With a 54kWh battery from a Tesla Roadster and two motors end-on-end, it’s 0-60mph (0-97km/h) time has been improved by close to 1 second so “it’s certainly got a little bit of spirit!”. It took a while for the Porsche Mission e to get an official name. Even after settling on Taycan, however, it seems like Porsche wasn’t done naming stuff. So with that, meet the German fast-charging station with a brand new name: Porsche Pit Stop. Part of the company’s planned EV charging network of 500 EV charging stations in North America, the Porsche Pit Stop is scheduled to be installed next. Just in time for the launch of the all-electric Porsche Taycan, in fact. Once ready, they’ll be able to charge the Taycan’s 800-volt battery in “ultra fast” time … whatever that means. Even that charging network, though, is just part of a bigger plan to make Porsche buyers forget that there’s another super ultra fast charging network out there for a similarly fast, electric sedan. Porsche pretty much admits to it in the following excerpt from their release. Porsche announced that it is adding a new 32-tonne all-electric truck to its commercial fleet to be used for the preparation of the production of the Taycan, Porsche’s first all-electric vehicle. The German automaker says that it commisioned truck maker MAN to produce the all-electric truck. It is equipped with a 149 kWh battery pack that enables 130 km of range. The battery-powered eTruck is a MAN eTGM 18.360 4×2 LL. The type designation indicates that the truck is a semitrailer tractor and belongs to the 18-tonne weight class, while the overall combination with a semitrailer is designed for a total weight of 32 tonnes in delivery traffic. The 360 figure represents the horsepower of the 265 kW eTruck. Lithium-ion batteries with a storage capacity of 149 kWh are used to store energy, making it possible for the eTruck to cover a range of 130 kilometres. Porsche is reportedly doubling the planned production capacity for the Taycan, its first all-electric vehicle, to a massive 40,000 units per year. Previously, Porsche was reportedly planning to produce about 20,000 Taycan vehicles per year. At 40,000 units per year, it would become one of the company’s largest vehicle programs behind its SUVs like the Cayenne and Macan. German magazine Automobilwoche reports that they have now approved the expansion of the production capacity to 40,000 units per year. De volgende generatie van de Porsche Macan krijgt alleen nog elektrische aandrijving. De compacte SUV wordt in 2021 het derde elektrische model van het merk. De Taycan, de eerste volledig elektrische sportwagen van Porsche, gaat eind dit jaar al in productie. Kort daarna volgt de Taycan Cross Turismo, de avontuurlijke versie van de Taycan.